If you have a history of poor dental health or have many missing or damaged teeth, you may be a good candidate for All-on-4®. This restorative treatment replaces the existing teeth with a fixed denture attached to a set of dental implants. A more comfortable and secure alternative to traditional dentures. A natural-looking smile. Enjoy greater confidence in everyday social settings. A fully functional bite. Get back to eating the types of food you may have given up because you couldn’t chew properly. As an expert in dental implants, Dr. Gocke’s experience lends itself to predictable and durable outcomes with the All-on-4 procedure. He leverages his training and years in practice as an oral and maxillofacial surgeon to create a natural appearance, promote long-term oral health, and improve daily comfort. Why All-on-4 and Why Our Practice? All-on-4® is a great alternative to traditional dentures for patients who have many teeth that need to be replaced. 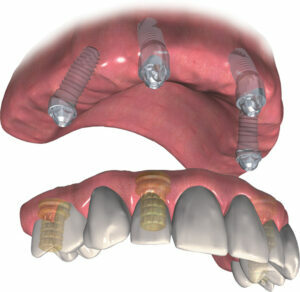 The treatment connects a fixed denture to four or more dental implants. This denture is smaller and more comfortable because it does not sit directly on the palette. All-on-4 looks and works more like a patient’s real teeth. The appliance isn’t removed at night and can be brushed and flossed like natural teeth. Northern Virginia patients can expect greater strength when chewing food and none of the slippage that is common with long-term denture wear. Just as importantly, Dr. Gocke can use the All-on-4 approach to restore a complete set of teeth in a single day. Patients come to the practice with missing and damaged teeth, and they leave with a natural-looking restoration. Patients rely on our practice because of Dr. Gocke’s expertise in the procedure and our commitment to their experience. We frequently host international patients and can help them arrange their visit as well as their care. All patients can take advantage of the amenities in our practice, including memory foam chairs, individual screens with Netflix, and warm blankets. During your initial visit to our office in Northern Virginia, Dr. Gocke will perform a thorough examination to determine if All-on-4® is right for you. He will also use state-of-the-art 3-D CT scans to evaluate the supporting bone structure that will anchor the dental implants. This step will allow him to determine if you will require bone grafting as part of your procedure. Once Dr. Gocke understands your needs, he will confer with your restorative dentist and a lab technician to develop a treatment plan; review the treatment plan with you and answer any questions that you may have. You will also have the opportunity to speak with a financial coordinator so that you can have complete transparency into the costs associated with All-on-4. All-on-4® is a multi-stage procedure based on the plan that Dr. Gocke, the restorative dentist, and the lab technician jointly develop. Dr. Gocke provides treatment using IV sedation so that his Northern Virginia patients can be comfortable and relaxed throughout their care. Typically, the process takes 3-4 hours instead of the typical 30-45 minutes that a standard dental implant procedure takes. In the first phase, Dr. Gocke will extract any remaining teeth, perform bone grafting in areas of need, and place four or more dental implants in the dental arch. Establishing these dental implants in strategic locations will give the final restoration greater strength and stability. In the second phase, the lab technician and restorative dentist will work together to adjust a temporary denture and attach it to the newly placed implants. The temporary denture will replace your missing and damaged teeth with an aesthetically appealing prosthetic. After treatment with All-on-4®, our staff will guide you to a private recovery room. We will help keep you comfortable and safe as you reach a normal level of alertness. Then, we will review post-operative care instructions and schedule your follow-up appointments. While the temporary denture will look like a natural set of teeth, Dr. Gocke advises his Northern Virginia patients not to chew on these teeth for 3-4 months. After this period, you will return to the practice for a check-up. Once Dr. Gocke determines that your implants are well-integrated with your jaw bone, he will refer you to your dentist, who will produce and attach your final prosthetic. Once the process is complete, you should be able to enjoy a natural-looking smile, greater comfort when chewing, and better long-term oral health. Are there different options for payment? Yes, our practice works with patients to make the procedure as affordable as possible. You can speak with our financial coordinator to discuss options like CareCredit®, monthly payments, and loans. What is the timeline for All-on-4? We understand that our Northern Virginia patients want the benefits of treatment as soon as possible. Dr. Gocke uses a variety of techniques to improve healing time. Typically, patients can expect treatment to take 3-4 months. Those who require extensive bone grafting may need additional time to ensure a strong foundation for their implants. Is there a lot of pain after the All-on-4 procedure? No, there is limited discomfort following the treatment. Many of our patients only take over-the-counter pain medicine the next morning and don’t continue with medication afterward. the-counter pain medicine the next morning and don’t continue with medication afterward. All-on-4® treatment can be an ideal solution for patients who are dissatisfied with dentures or who have been living with multiple missing or damaged teeth. Learn more about treatment by calling (703) 338-2805 to schedule an appointment with Dr. Gocke at his Northern Virginia offices.